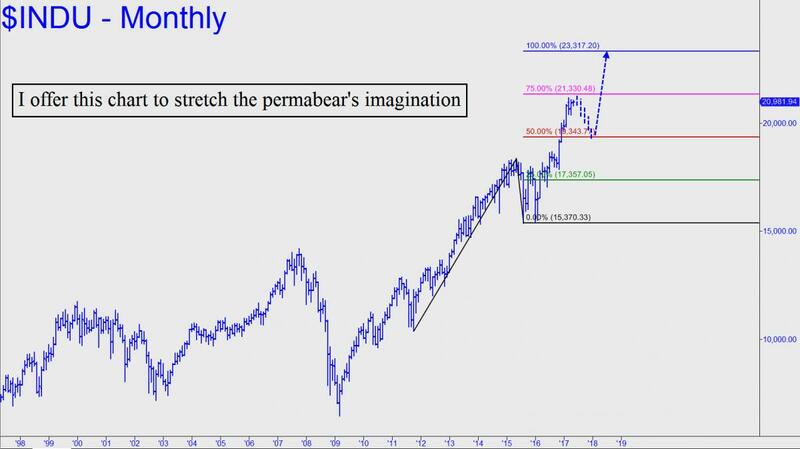 Permabears in particular will find this hard to believe, but the Dow Industrial Average could levitate a further 2336 points before it hits something solid. Even some bulls might find the 23317 target shown in the chart (see inset) a tad optimistic. But charts don’t lie, and in this case the force with which the Indoos impaled the red line, a midpoint Hidden Pivot resistance at 19343, makes a run-up to 23317 a good bet as far as I’m concerned. Of course, I could give you a dozen good reasons why the blue chip average would be more fairly priced at 10,000. But I have to keep reminding myself that all the ‘good reasons’ in the world have in no way impeded the progress of this epic bull market since it began in 2009. We’ll lay out some shorts at the pink line, the pattern’s ‘secondary’ Hidden Pivot, nonetheless, since it is a logical spot for the bull to reverse, if only temporarily. In the meantime, we should not presume to understand what’s on Mr. Market’s nasty mind — other than that he will fool most of us at the top.